Yup, it was worth the trip. Too bad we couldn´t get the playstation game, which was not yet available, but the movie was a pleasant surprise. G.I.Joe - Le Réveil du Cobra ("the awakening of cobra"... which was not a bad translation at all... a lot better than Portugal´s "attack of cobra"). Keep in mind that the French use an audio track in their native language, and the portuguese use subtitles. 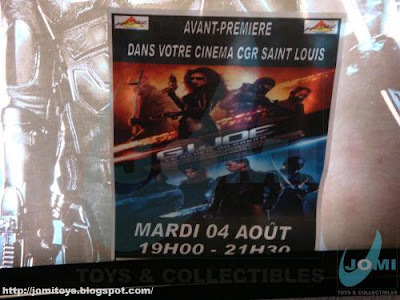 "The movie just ended, moments ago, and having travelled from Portugal to France to watch the movie which would only have its premiere a week later in Portugal, as a dedicated and unconditional fan of G.I.Joe, I feel pleased (even with audio in french). The details, the dialogues, the atmosphere, everything fitted in the world hasbro created decades ago. Small homages are caught by the watching fan. The scenes with the supersonic Cobra Night Raven are a highlight of the movie, as the so longed for duel between the "Storm Shadow" and "Snake Eyes" ninjas. The expectations were high, so were the stakes. Director Stephen Sommers knew it and took it with courage. Having Larry Hama (the original storyline creator) as a consultor, proceeded to some character and storyline changes, in the sense of globalizing “team” G.I.Joe which to that moment was a north American reference. In a time which iconic characters conversions to the big screen are common and as requested as criticized, the movie could be better, could be worse, but the important thing was that it was not ruined in terms of storyline and credibility. And it wasn´t. Those who remember the action figures and have present their childhood with their fantastic vehicles, will love it. Loaded with action and scenes although not memorable or oscar worthy, are visually impressive. You can perfectly tell “The Mummy” director´s hand on this movie with more explosions than a Michael Bay´s film. When interviewed, he referred that on one of the most original pursuits in cinema, at some point the record of car wrecking on a movie was broken. One can´t tell the passing of time, since Stephen Sommers delivered with the promise of pace. With a casting formula similar to Star Wars having Dennis Quaid , the action movie veteran leading the international organization and Marlon Wayans (Scary Movie) in a not so usual hero part, and some other recognized names serving as anchors, the actors do not disappoint and the story doesn´t lose. To the generation between 30 and 35 it’s a movie which will bring nostalgia. To those who are a little younger than that, some memories. To all others, a lot of fun. Keep in mind that this movie is widely based on the action figures universe and their world of good and evil sides very defined, with the villains taking the world for ransom and the heroes saving it. It´s a not a serious, deep movie, as it´s not ridiculous. With fight scenes reminding Jackie Chan, in technique and comedy, it´s an action balanced film. With humorous moments, some drama ones and even a little romance, the nearly 2 hours of movie are everything rather than lost. Not being an excellent movie, and contextualizing it in its gender, maybe average, it’s a good matinee flick. Whomever wants a popcorn movie and have a little fun, won´t be disappointed. They will probably even google about it when they get home."